Open The Gates Of Hell is already the sixth album by Mystic Circle, one of Germany's leading black metal bands. Again the internal trio from Worms prove that they are one of the best extreme metal bands. There are only a few band able to combine brutal and aggressive death metal riffs with classical black metal vocals. Songs like Awaken By Blood, Burning Souls or Demoniac Dimension are just a few good examples that underline the variety which can be put into this kind of music. 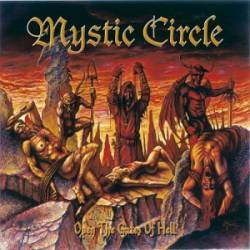 Compared to their last two albums The Great Beast (2001) and Damien (2002), Mystic Circle have become even more merciless than ever before. A musical progression cannot be denied. Very strange and unusual is the song Wings Of Death where Mystic Circle dare to head into a more gothic direction. That song does not only contain lots of keyboards and female vocals, but it is quite danceable (!) as they intend to make it a club hit. So far the positive aspects on this CD. Negative points are that the album is only 35 minutes long and contains only 8 real songs. Maybe they released the CD too early and should have waited until more songs would have been written.